Mine to mine challenge today, up in the beautiful portion of Colorado. Cripple Creek gold mine to Victor gold mine, so pretty at 9500 feet to see the high mountain peaks in the distance. Top 3 got gold nugget prizes ($500, $200, $100 in value respectively). My goal was run the downhill hard first 5k and then survive the uphill last half. I hoped to sneak into the top 3 if possible, but I knew that the field is usually pretty good. Started out flying downhill, 3:15, 3:21, 3:26 first 3km, 10:02 first 3k, pretty good for me, was in about 7th place (was counting the men ahead of me to be conscious of where I needed to get to). hit the flats and slowed down (was actually rolling hills), 17:25 through 5k. By this point the actual course markers were short, so my 5k split is from my watch and should be acccurate, pretty happy with that despite the slowdown. Hit the huge uphill between 7-8k and it was terrible, but I didn't slow to much above 6:50 pace, so that is a positive. Also, by the hill I had moved into 3rd and passed all the ladies so was 3rd overall. It was a challenge to breath at this altitude going uphill, but I pushed through the pain because I knew I was in "gold" contention. 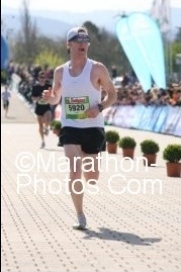 Finished officially in 31:26, however, my watch had 8.5 km instead of the 9k it was supposed to be. Regardless, I was happy to have run a race with a challenging 2nd half at altitude and place. Got my $100 worth of gold nuggets plus a core sample of quartz that they said probably has some gold value in it. Very neat awards. The registration was only $38 and I got a lot for it - not to mention the cool awards, but they gave everyone a drawstring bag, a really nice long sleeve tech shirt and a museum book from the Cripple Creek museum (i love books!). Overall, a great day, fun race, great scenery, friendly people, and surprised myself by winning an awesome award!